Newton Stewart are searching for a new manager following Andy Walker’s decision to resign after losing their first seven league games. A 4-2 defeat to Nithsdale Wanderers last Saturday proved to be the final blow for Walker, who leaves the club bottom of the South of Scotland league. Annan are the only other side who have lost all their league games, and they will hoping to kickstart their campaign when they face Wigtown and Bladnoch in the Cree Lodge Cup this weekend. Newton Stewart, meanwhile, will also be hoping for better fortune when they visit Creetown, while Nithsdale are away to Lochar Thistle. At the other end of the table, Bonnyton Thistle continued their impressive start by booking their place in the Alba Cup final against Mid Annandale. A Kyle Gilroy double helped the Kilmarnock outfit on their way to a 4-2 win over Upper Annadale last weekend, while in the other semi, Mid Annandale beat Lochmaben to set up the showdown against Bonnyton on November 17. This weekend, leaders Bonnyton host South of Scotland League holders Threave Rovers in the Cree Lodge Cup. Threave will be hoping to build on their 4-1 win over Dumfries last weekend. Mid Annandale host Heston Rovers on Friday night. 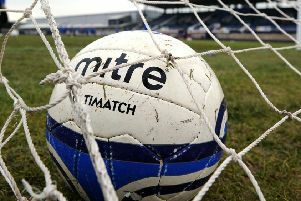 Other league pacesetters Stranraer, who have won their first six games, are away to Lochmaben in the same competition. Abbey Vale maintained their unbeaten start to the season with a convincing 4-0 win over Creetown and will fancy their chances on Saturday against St Cuthbert’s Wanderers who have had an indifferent start to the season. St Cuthbert’s were beaten 4-0 by Lochar last weekend. Fixtures: Mid Annandale v Heston, Bonnyton v Threave, Creetown v Newton Stewart, Lochar v Nithsdale, Lochmaben v Stranraer, St Cuthbert v Abbey, Upper Annandale v Dumfries, Wigtown and Vladnoch v Annan.